Lever is fully integrated with Google Calendar, which makes it easy to view the availability of your interviewers and schedule them for an interview within a seamless workflow. 1. From the candidate profile, select the "schedule" button. 2. Or, use the blue “schedule" button from your candidate list. First, select the date of the interview, then select the colleagues who will interview with the candidate. Note: If there is a default interview flow/kit associated with a posting, the default interview slots and feedback will automatically populate in the scheduler. Forms can be added or removed after the default forms have been added. Customize the time of your interviews, even change the duration for each. Designate specific feedback forms for your panel members to fill out so they know what to focus on. Lever supports conference room booking through Google Calendar. We also recommend using a shared “Interviews” calendar. Clicking the blue “Schedule” button will bring you to a summary of your calendar invitation. And don’t worry about hassling your interviewers for feedback -- let Lever take care of that automatically for you! Select how often you’d like to remind your interviewers to submit their feedback. You can easily send candidates a confirmation email and/or Google Calendar invite just for the candidate so they don’t accidentally see any internal communication. Feel free to use an email template too! In the final preview mode, you can make any adjustments or additional edits. 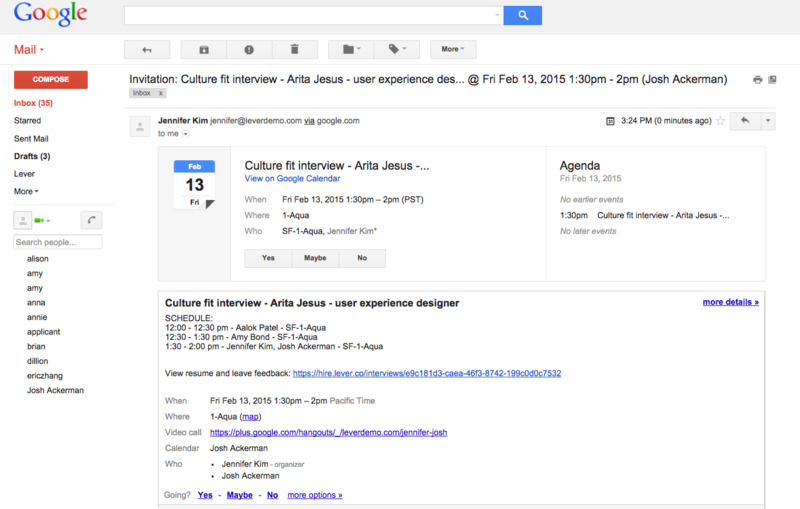 Once you send out the invitations, your interview panel will receive a Google Calendar invite. The link in the invite will bring you straight to the candidate’s resume and the feedback form. Note: Calendar events only sync in one-direction, so you must reschedule interviews in Lever, not on Google Calendar, in order to correctly reschedule reminder emails. How do I reschedule an interview? How do I schedule an interview in a different timezone? How do I add/source candidates to Lever from LinkedIn using Lever's Chrome extension?